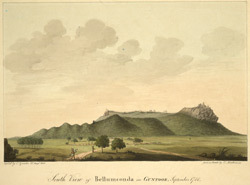 Bellamkonda or ‘the hill of caves’ is situated in Andhra Pradesh at a height of 1,569 metres above sea level. The fortress is roughly the shape of an equilateral triangle enclosing an area of approximately a square mile and consists of a single stone wall connecting the elevated parts of the hill with bastions at the south-east and north-west angles. The early history of the fortress is obscure, however, it is said to have been constructed by the Reddi kings of Kondavid. After their power had passed away in 1482 it perhaps fell into the hands of the Orissa kings, then the kings of Vijayanagar, before it was finally taken by the Muslims in 1578, when they put an end to Hindu rule in this part of the country. At the close of the eighteenth century the English had a few troops stationed at the bottom of the hill in mud huts.